Students listen as other students read and talk about their pieces for Images. Artists, authors and honors students showed off their work April 10 in an Images reveal party and an honors programs showcase, respectively. 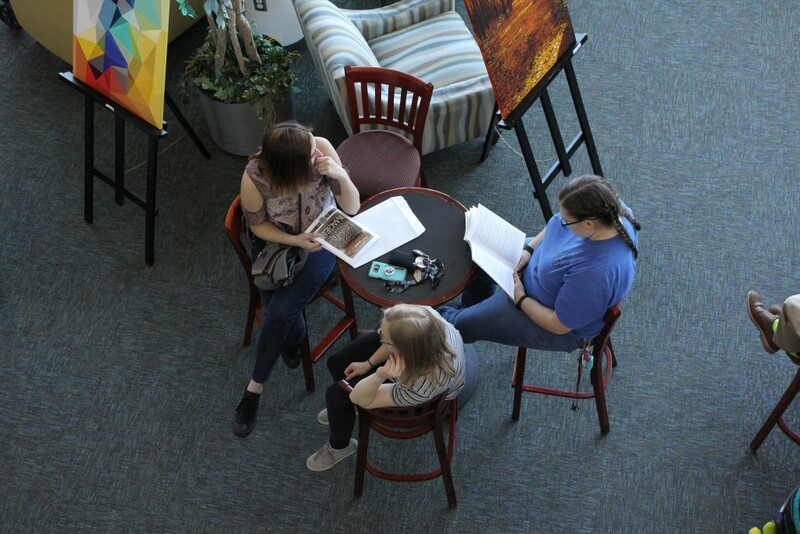 Students with work published in the latest edition of MCCC’s literary magazine had the chance to talk about their art or read their poems and stories in the Meyer Theater atrium. In the conference room on the other side of the wall, honors students discussed the projects they’d been working on. For Images, students painted and sculpted and wrote. For the honors program, students dove into calculus, construction, and controversial topics. Images can be viewed at: http://www.monroeccc.edu/humaniti/MCCC-Images33-2019.pdf.